On 1st April 2010, the British Government announced designation of the British Indian Ocean Territory – or Chagos Archipelago – as the world's largest marine protected area (MPA). This near pristine ocean ecosystem now represents 16% of the worlds fully protected coral reef, 60% of the world's no-take protected areas and an uncontaminated reference site for ecological studies. In addition these gains for biodiversity conservation, the Chagos/BIOT MPA also offers subsidiary opportunities to act as a fisheries management tool for the western Indian Ocean, considering its size and location. While the benefits of MPAs for coralreef dwelling species are established, there is uncertainty about their effects on pelagic migratory species. 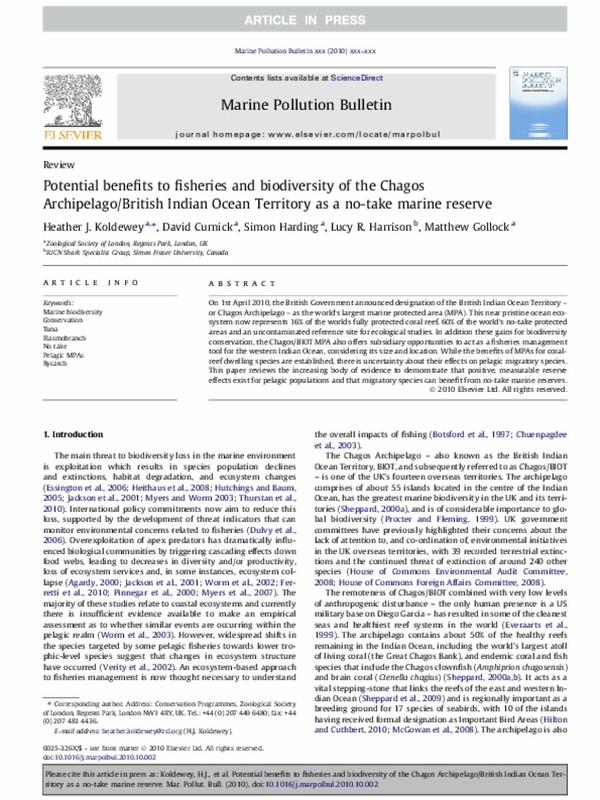 This paper reviews the increasing body of evidence to demonstrate that positive, measurable reserve effects exist for pelagic populations and that migratory species can benefit from no-take marine reserves.